Zircaloy is a zirconium-based alloy with additions of alloying elements like tin, iron, chromium, nickel and oxygen. This alloy is used for fuel cladding tubes, nuclear reactor core structural components such as calandria tubes, pressure tubes and garter springs. These fuel cladding tubes of Zr-4 have 15.215 mm OD and 0.38 mm wall with tolerance ± 0.037 mm on OD and + 0.076/- 0.00 mm on wall. These tubes are produced by vacuum arc melting of ingots, hot extrusion, cold pilgering followed by vacuum annealing. These thin wall tubes are required to meet high degree of soundness and dimensional integrity as per specification given by NPCIL, India. The soundness of the tubes is being checked by using high speed computerized, fast response, probe rotation ROTA-25, Ultrasonic tube testing system. So far, around 4,200 km. PHWR fuel tubes have been tested with the above UT system. During testing it was found some of the tubes are having defects like laminations, cracks, pits, porosities, rough surface etc. which causes rejections during ultrasonic testing and low recovery at finished stage. 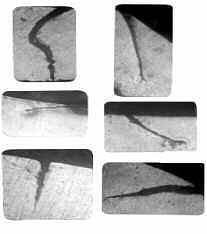 In order to improve the recovery a study was made to find out the origin of the above defects related with different fabrication steps. Thus paper brings out clearly the studies and investigation regarding the origin of the defects and necessary corrections needed. Key Words: Thin walled tubes, ultrasonic testing, Zr-4, soundness, integrity, probe rotation technique, origin, defects, laminations, cracks, porosities, recovery, investigation. Also of unknown size, irregular & complex shape. These factors, together with specific sound attenuating characteristics of bulk material affect the height and shape of echo signals. Echo height is a direct function of the area of the reflecting interface. Most of the non-destructive testing acceptance criteria are concerned with flaw depth, but ultrasonic technique does not measure the actual flaw depth. Rather, the flaws test response amplitude is compared to the reference notch depth amplitude. Generally, V type notch 60 ± 1° depth 10% of wall thickness or 0.037mm (maximum) in longitudinal and transverse direction on outer surface and inner surface is used as reference standard for calibration of UT systems. 10 & 15 MHz line focused transducers were used for bi- directional, 4 - level UT testing. Also, a special UT standard with different notch lengths was also prepared and used to compare the defect detected during testing. Advanced computerized data processing systems provided control cards and control runs to check the stability and sensitivity of calibration and most sophisticated electronic set up were used for correct recording of defects. A total 375 nos., (from 25 lots representing various melts) PHWR fuel tubes flaw marked pieces exceeded the flaw alarm threshold of reference notch depth 10% of wall thickness (0.038mm) were selected for defect analysis. These defective portions of the tubes were cleaned properly and bright pickled to see the type of defects and their locations on outer or inner surface of the tube. Metallurgical and visual evaluation of defective portion of tubes was carried out to correlate the causes of rejections with type of defects and probable origin of defects related with various processing steps. Expertise in metallography and ultrasonic inspections made possible to identify the deleterious defects. Defects were more on inner surface (54.93%) than outer surface (45.07%). Defects in decreasing order were: Cracks & laminations on ID (44.53%) - Grinding defects on OD (18.93%) - Rough surface on ID due to sand blasting (8.80%) - Cracks on OD (8.53%) - Pilgering defects on OD (6.67%) - Burning due to grinding on OD (2.93%) - Porosity in ingot (1.60%). Deep-scoring lines on ID of blanks due to failure of copper jacket, cracks in billet, necking of mandrel and improper soaking time and temperature. Rough inner surfaces: Uneven size of sand used for sand blasting & non-uniform supply of compressed air during sand blasting. Porosity in ingot: High leak rate and presence of volatile material in sponge. Grinding defects: Uneven size of SiC particles of grinding belt. Handling defects: Wrong handling of thin wall tubes on shop floor. tension of grinding belts is not proper. Any natural defect, which does not adequately match the orientation and reflection area of notch, might not be detected. Though, the actual defect must be larger than the notch. 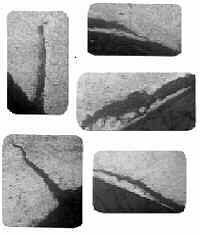 Maximum defects were cracks (44.53%) on inner surface of the tube, which were responsible to lower the recovery by 4% - 6%. Hence, the entire fabrication route was studied in detail and improvements were made particularly in extruded quality of blanks, tooling used for pilgering and lubricant used for inner surface of tube. Other defects due to pilgering, grinding and sand blasting were controlled by introducing regular in-process quality control during fabrication of precision thin wall tubes. A total of 10% more recovery was achieved by introducing in-process quality control and study of origin of defects detected by Ultrasonic Testing. The authors express their sincere gratitude to Dr. C. Ganguly, Chief Executive, NFC for permission to present this paper at 15th World Conference on Non - Destructive Testing (15 -21 Oct. 2000), Rome, Italy. The authors are also thankful to Shri Harinder Singh, SO/E & Shri C.V.Bhaskara Rao, GM, (ZF&T) for cooperation and support in providing information on PHWR fuel tubes.